Aiden Harrold is a 4th grade student in Devine. For fun, he loves a unique sport called midget car racing, and he would like to see if any other children in our local community would like to learn about the sport and participate! His sport/hobby is racing quarter midget race cars. He belongs to the San Antonio club and races about two times a month from February through November. Boys and girls compete against each other for the race and for points in the regional standings. Last year was his first full season of racing quarter midget race cars. He is an exceptional driver and finished 2nd in the region in his class. He has numerous 1st place finishes and consistently finishes in the top 3. Last season he drove in the Junior Honda class, 120cc engine with a “blue” restrictor plate. This season he will move up to the Senior Honda class which uses the same engine but without the restrictor plate. Racing is done locally at a track in San Antonio; other clubs (tracks) included in the region are in Austin, Houston, Tulsa Oklahoma, Albuquerque New Mexico, Missouri, and in Minnesota. Many professional drivers began their racing careers in quarter midget cars. Some of the more popular ones are A.J. Foyt, Johnny Rutherford, Swede Savage, Bobby Labonte, Terry Labonte, Jimmy Vasser, Sarah Fisher, Ryan Newman, Joey Logano, and Jeff Gordon. Quarter Midget racing is governed by the United States Auto Club (USAC) which also governs midget and Sprint car racing. The cars are open wheel and require USAC safety requirements. 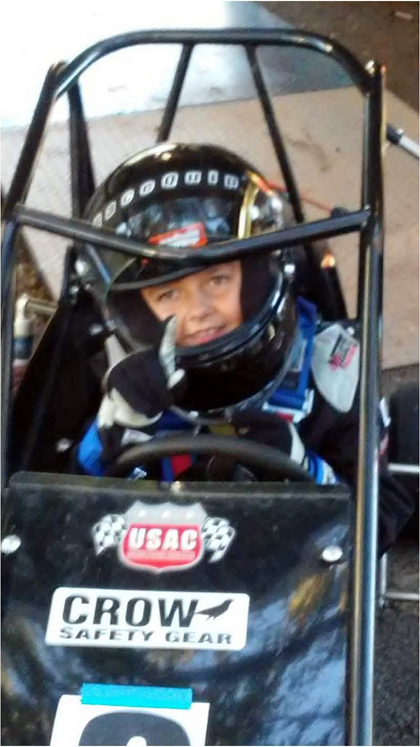 Below is a description of the sport from the San Antonio quarter midget racing club: “USAC .25 Midget Racing is a family oriented sport that involves racing in special prepared cars. The cars, rules and safety procedures are designed specifically for kids. They race on oval tracks approximately 1/20 of a mile. Children ages 5 to 16 years can race. Safety features include full roll cages, multi-point seat harnesses, full face helmets, and other gear. USAC is constantly reviewing and evaluating safety rules to ensure that quarter midget racing remains a safe competitive sport. The racing environment is about children and family. Not only do kids learn valuable skills and sportsmanship, but they also make new friends. Mom and Dad will make new friends too.